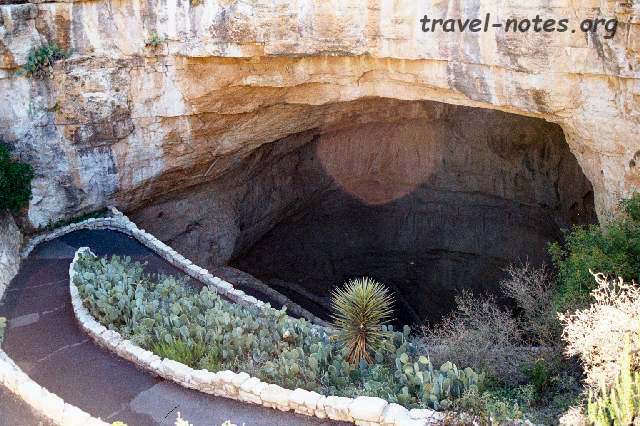 Carlsbad Caverns National Park, one of the lesser known parks in the US, in short is a 'must-see'. It is situated 2 hrs east of El Paso (which by the way, is the nearest big airport) in the New Mexico - Texas border. These caverns are so huge that you would need nearly two full days to 'see' the place to some degree of satisfaction. The main chamber of the caverns, known as the Big Room, is about the size of 114 american football fields. Among the many stalagmites, stalactites, columns, pools, draperies etc., the places that remain in your memory are the 'Giant and Twin Domes', Lion's Tail, Rock of Ages, Frozen Waterfall and the Painted Grotto. All these spots can be covered in the self guided 1.5 hr long Big Room Tour. The Big Room itself is 750 ft under the ground and if you want a better way to reach there other than using a lift, think of the Natural Entrance route. It is an hour long self guided down hill hike taking you through fallen rocks and some more spectacular formations - the pick of them being the Whale's Mouth. You will start descending into a mammoth opening on the ground deep into a cave which becomes progressively larger. Apart from these two self guided tours, there is also a two-hour long 'Kings Palace' guided tour. The tour is a must for all those who are interested in finding out about the history of the place (both human and geological) and for those who want to 'be a blind man' for a couple of minutes because during that tour the guide shuts of the light so that you can 'see' the total darkness. The people out there claim that this is the darkest spot on the universe! Well, all I can say is that I felt sorry for blind people. If all that they see in their lives is what I saw in those two minutes, I know exactly where my vote is going for the most important sense organ competition. The best time to visit the Caverns is during the months of August and September because apart from spending a strenuous day inside one of the darkest hole on the earth, you also get to see an unique 'bat flight' demonstration. 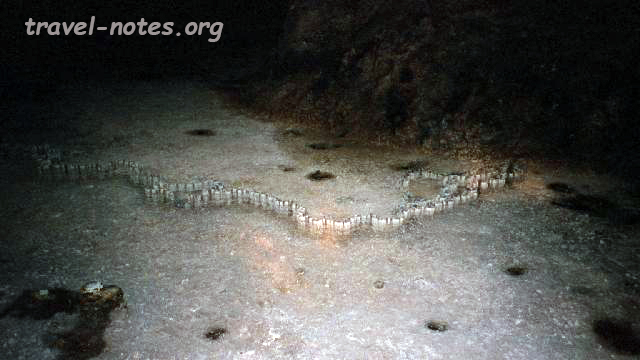 Thousands of Mexican free tailed bats, which make this cavern as their summer resort, leave for dinner at dusk. If you make sure that you are present at the amphitheatre in front of the natural entrance at that time, you can see a huge continuous spiral of bats flying out of the cave, out into the clouds, in search of dinner. My only piece of advice is keep your mouth shut when you look up to see the bats fly over your head. If you have the time, I strongly advice you to spend one extra day at the caverns and take one of the 'challenging' tours. These tours are about 2-4 hrs long and include climbing 100 ft in total darkness and crawling through rat holes and crevices. If you ask me, of all the tours offered, the one you should never miss is the Slaughter Canyon tour. It is only about 2.5 hrs long and does not require you to crawl through small openings and more importantly does not require a 2 to 3 month advance booking and it is also most rewarding as far as the sights that await you at the end of the journey goes. But this tour requires you to climb 0.5 mile up a mountain, carry your own water and spend 2.5 hrs inside a dark cave with the only light source being the torch light that you hurriedly bought at the gift shop. At some parts of the trip, you will have to pull yourself up some slippery rocks with ropes. You would say it is all worth it when you see the 'Great Wall' (a formation which looks like a miniature Great Wall of China), the Clansman (a formation which looks like a skeleton - one which appeared in the King Solomon's Mine movie) and the Christmas tree (a formation which looks, well, like a Christmas tree). For the people who were impressed with the Lurey Caverns in Virinia, I have to say just one thing : Lurey at best is a poor man's Carlsbad. In case what I wrote doesn't appeal to you or feels like a figment of my overactive imagination, well, I am not the first to be in such a situation. Jim White, the 16 year old cowboy, took about 16 more years to convince another human being that this place was worth visiting ! 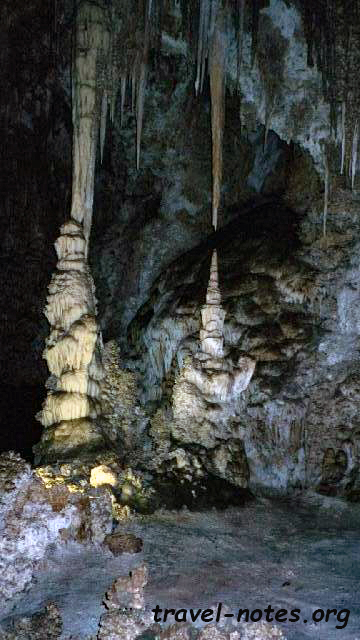 I think I should also add that, if the photographs are any indication, the Carlsbad Caverns is a poor man's Lecheguilla. It is a pity that the Lecheguilla caverns, one of the recent discoveries in this area, is open only to researchers and not to general public. And my final piece of advice if you are planning to go to Carlsbad is : take a very powerful flash along with your camera. 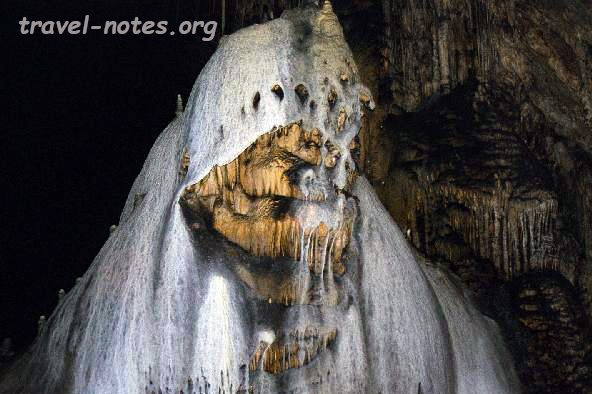 Click here for more photos from Carlsbad Caverns. 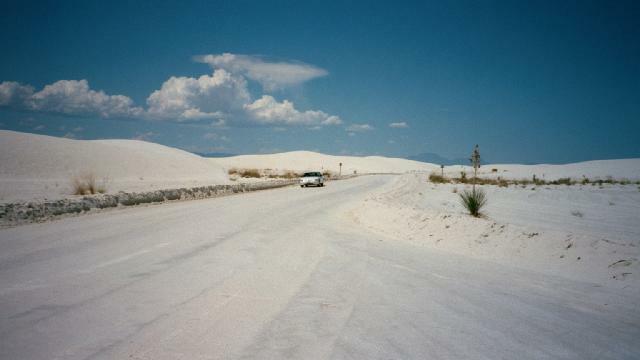 White Sands National Monument is situated at a good 4 to 5 hrs drive from the Carlsbad Caverns. If you have an afternoon to spare after a tiring tour of the caverns, you can consider stopping by the White Sands on your way back to El Paso. This would be your only chance of visiting this place as this place would probably not entice you to put a separate trip to this area. The "sand" is actually gypsum deposited in this area by the wind and the presence of these deposits accounts for the lack of presence of vegetation. Not many plants can survive the challenges posed by the constantly shifting dunes. Only the ones which have a short life cycle and the ones which can outgrow a dune are found in this area. Apart from a drive, there are couple of walking trails available through the dunes and if you are taking any, remember to take enough water. The entrance gate is the only place where you can get drinking water.